This illustrated booklet describes the geology of the Reculver Country Park, a classic coastal section on the north Kent coast. The sedimentary beds exposed in the cliffs are detailed together with the local ‘drift’ deposits. The landscape of the Country Park is explained with the silting of the Wantsum Channel to the east, marine erosion to the north and the impact of numerous historical landslips on the coastline. 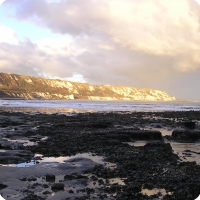 The booklet includes a circular walk for the geological beginner from Reculver to Bishopstone Glen and back highlighting many of the geological and landscape features to be seen. This well illustrated booklet describes the building stones used in the two nationally important scheduled monuments at Reculver: the wall of the Roman Fort of Regulbium and the remains of St Mary’s Church. The booklet includes a walk along the surviving perimeter wall of the Roman fort identifying the various stones you can see as well as some of the building techniques employed. Finally there is an review of the historical background on the coastal defences and an illustrated survey of the principal stones to be found in the sea defences in the Country Park. This profusely illustrated 28 page booklet details the building stones used in the construction of the St Augustine’s Abbey in Canterbury. The abbey site provides an unparalleled range of medieval building materials both representative of those commonly used in East Kent and accessible to the public. The booklet includes numerous photographs, maps and a plan of the site showing the location of the stones illustrated. Both of the above Reculver booklets can be purchased for the combined price of £8.00 including postage and packing. All three publications can be purchased for £10.00 including postage and packing. When Wealden News issue No.7 was published in September 2007 Kent RIGS agreed to carry a downloadable PDF version on its 'News' page to extend readership. Issue No.6 was subsequently reworked, to reduce the memory required, and also converted to a PDF version. This proved such a popular addition to the website that Kent RIGS has decided to accept a proposal that all seven issues of Wealden News now be made available through its website. This dedicated page, linked from the front page, makes issues of Wealden News more readily available. SUMBLER, M.G. 1996. British regional geology: London and the Thames Valley (4th edition). (London: HMSO for the British Geological Survey). GALLOIS, R.W. 1965. British regional geology: The Wealden District (4th edition). (London: HMSO for the British Geological Survey). COLLINSON, Margaret E, Fossil Plants of the London Clay (The Palaeontological Association).